This petition has been created by Kamayani m. and may not represent the views of the Avaaz community. Today, on 6th June 2018 at 6 am in the morning, Professor Shoma Sen, Advocate Surendra Gadling, cultural activist Sudhir Dhawale, human rights activist Rona Wilson and anti-displacement activist Mahesh Raut were arrested from different locations in Nagpur and Delhi by the Maharashtra police. Professor Shoma Sen, Head of English Department in Nagpur University and member of Women against Sexual Violence and State Repression (WSS), Advocate Surendra Gadling, General Secretary of Indian Association of Peoples’ Lawyers (IAPL), Sudhir Dhawale, editor of the Marathi magazine Vidrohi and a founding member of the Republican Panthers, Rona Wilson, human rights activist and Secretary of Committee for the Release of Political Prisoners (CRPP) and Mahesh Raut, anti-displacement activist based out of Gadchiroli are reportedly arrested in connection with the Bhima-Koregaon riots that took place in January 2018. These arrests follow intense harassment of these activists; and many of them had their houses raided earlier this year in April by the Maharashtra police along with raids at the homes of Kabir Kala Manch (KKM) activists Rupali Jadhav, Jyoti Jagtap, Ramesh Gaichor, Sagar Gorkhe, Dhawala Dhengale in Pune and Republican Panther activist Harshali Potdar. these arrests are in response to the assertion of dalit, Adivasi, OBC, Muslim unity during the Bhima Koregaon Shaurya Din Prerna Abhiyan organised by the ‘Elgaar Parishad’ in Shaniwarwada in Pune this year on 31st December 2017. The Abhiyan was organised at the eve of the bi-centenary of the battle between the Peshwas and the British near the village of Koregaon on the Bhima River. The British regiment largely consisting of people from the Mahar community had stood up against the Peshwas and this is seen as a fight against the Brahmanical forces historically perpetuating caste discrimination against some of the most marginalised people of the country. Today, this battle is being witnessed again under the regime of Brahmanical Hindutva fascism of the current government that is crushing the voices of the marginalised once again through its coercive forces. This year, the Abhiyan was attacked by right wing organisations in the state of Maharashtra, and attackers were brandishing saffron flags, with the active support of the state police. This resulted in the death of one and injuries on several people. 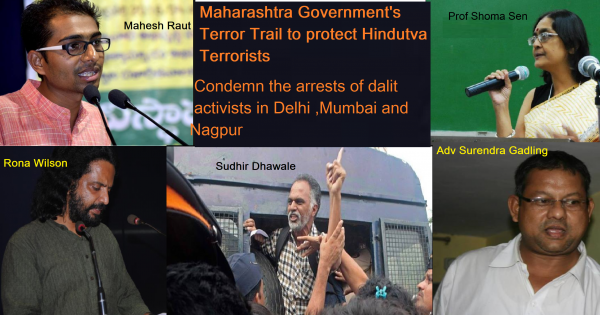 The leaders inciting the violence went on to file cases of violence against the organisers of the programme along with several unnamed persons, resulted in immediate, mass arrests of dalits, activists and participants, all over the state of Maharashtra by the state police. Those who attacked the Bhima-Koregaon Abhiyan were treated differently. Despite Sambhaji Bhide, leader of Shiv Pratishthan Hindustan and one of the main persons who orchestrated and incited violence, being charged under Scheduled Caste and Scheduled Tribe (Prevention of Atrocities) Act and Arms Act after widespread protests from across the country, he walks free and gloats about his actions openly while receiving the blessings of politicians and ideologues of Hindutva. Milind Ekbote of Hindu Ekata Aghadi was arrested in March 2018, but was out on bail a month later. The efforts to raid the homes of several activists, taking away their phones, pen drives, hard drives, and laptops of the activists of the Elgaar Parishad has deprived them of the evidence that proves the involvement of people like Sambhaji Bhide. Several activists who were not at the Elgaar Parishad programme are now being picked up and arrested in order to portray them as Naxals. This narrative suits the interests of the state that is bent on protecting the Hindutva brigade while attacking the dalits, adivasis, Muslims and women of this country. This is further illustrated after the death of Pooja Sakal, a young dalit woman, was found dead in mysterious circumstances in a well near her home in Koregaon. Instead of investigating this death, the police along with the caste Hindus of the village have worked hard to ostracise the entire dalit population from Koregaon’s dalit basti.Now, the string of arrests shows the targeted attacks on the people speaking for the rights of dalits, adivasis, Muslims and women. Instead of taking action against the perpetrators of the violence during Bhima Koregaon Abhiyan, the state machinery is focused on targeting activists, professors, and lawyers who have condemned the violence of the Hindutva leaders as well as the police. These raids come at a time when the people of the country from Thoothkudi to Kalinganagar, Gadchiroli to Delhi have risen up united against the anti-people policies of the state. The crushing of such voices of dissent is a direct attack on the democracy of this country and intends to intimidate people into silence.